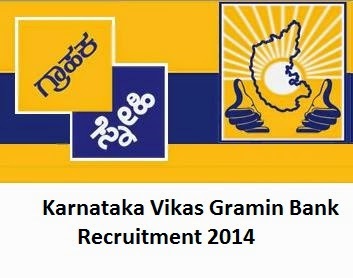 Karnataka Vikas Grameena Bank invites applications from Indian citizens, for the post of Officer in Middle Management Grade (Scale III), Officer in Middle Management Grade (Scale II), Officer in Junior Management (Scale I) Cadre and Office Assistant (Multipurpose) from Indian citizens who have been declared qualified at the Online CWE for RRBs conducted by IBPS during September/ October 2014. (a) Before applying for any of the mentioned post, the candidate should ensure that he/she fulfils the eligibility and other norms mentioned in this advertisement. Decision of the Bank in all matters regarding eligibility of the candidate, the stages at which scrutiny of such eligibility is to be undertaken, the documents to be produced for the purpose of the conduct of interview, selection and any other matter relating to recruitment will be final and binding on the candidate. No correspondence or personal enquiries shall be entertained by the bank on this behalf. Mere admission to the Online RRB CWE III and/ or passing the test and being invited by the Bank for the Interview shall not imply that the Bank has been satisfied beyond doubt about the candidate’s eligibility. Candidates who do not satisfy the eligibility criteria and who do not produce the photocopies as well as the originals of all the documents required to be submitted and as advised in this notification as well as in the Interview call letter, for any reason, whatsoever, shall not be permitted to participate in the Interview, even though they may have obtained the desired level of score in the Online CWE and have been called for interview. In case it is detected at any stage of recruitment that a candidate does not fulfil the eligibility norms and/or that he/she has furnished any incorrect/false information/certificate/documents or has suppressed any material fact(s), his/her candidature will stand cancelled. If any of these shortcomings is/are detected even after appointment, his/her services are liable to be terminated. (i) Candidates are required to apply online through Bank’s website www.kvgbank.com from 05.12.2014 to 22.12.2014. No other means/ mode of application will be accepted. (ii) Candidates should ensure that their personal email ID (as specified in the online application form while applying for RRBs- CWE III conducted in September/October 2014) is kept active during the currency of a recruitment project. Bank may send call letters for Interview etc. to the registered e-mail ID. (iii) Applicants are first required to go to the Bank’s website www.kvgbank.com and click on the link “Recruitment”. (iv) Thereafter, open the Recruitment Notification. (v) Carefully fill in the details in the Online Application Form. (vi) Candidates cannot edit their application after submission. (vii) Please note that the above procedure is the only valid procedure for applying. No other mode of application or incomplete steps would be accepted and such applications would be rejected. (viii) The Application printout along and required copies of documents should be kept ready for submission if shortlisted for Interview.